On March 2, 1973, the Bandierai degli Uffizi were born as an integral part of the historical procession of the Florentine Republic and the traditional game of Florentine Historical Football. The only group able to represent the city of Florence by virtue of the punctual historical meaning of their signs and their customs. For Florence and for the Florentines, they are a traditional presence in many events as well as in the usual game of Historical Soccer, but in their curricula they can count many world-class events. Among the most important international events we remember the performance at the Columbus Day celebrations in America, the opening of the World Soccer Championships in Spain, Mexico, France and Italy, where they held up the name of Florence and Tuscany. The historical group finds its temporal collocation in the XVI century and from this period all the costumes, the flags and the insignia of the principal Magistrature and Offices of the Florentine Republic are drawn. All the participants in the Bandierai degli Uffizi, as well as being driven by strong motivations for maintaining a historical culture of the city of Florence, are also driven by athletic and sporting motivations. 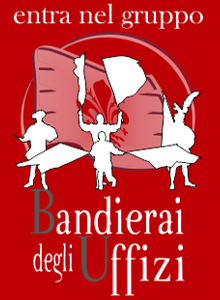 The flag-wavers and tambourines of the Bandierai degli Uffizi , besides the pride of being part of this group, represent historically and exclusively the Calcio Storico Fiorentino and the City of Florence. In order to guarantee this continuity over time the Bandierai have always paid great attention to the generational turnover and to the nursery of young members of the group. Children from 6 years old can take part in courses to be part of the flag-bearers and tambourines. 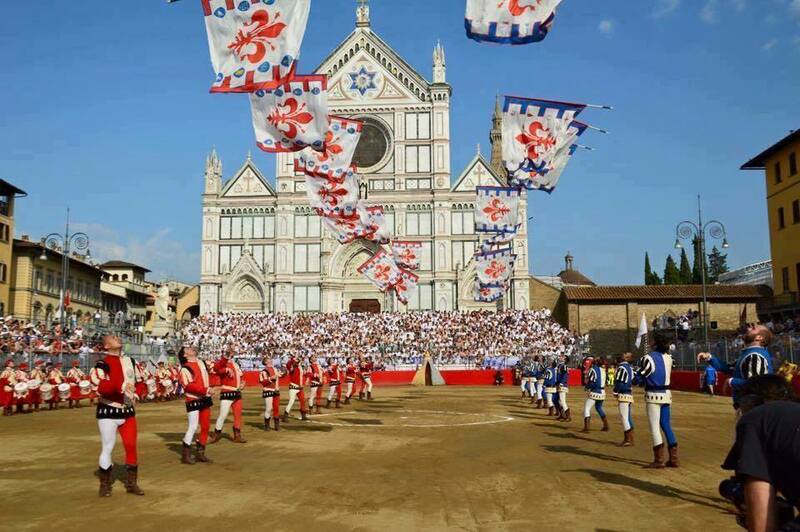 As a reward for their efforts, for some years, the small Bandierai have been shown before the exhibition of the group adults during the games of Calcio Storico Fiorentino. The Bandierai degli Uffizi perform in the streets of the city of Florence during the traditional Florentine festivals such as the Cavalcata dei Magi for the Epiphany, the Scoppio del Carro at Easter or the Festa di Santa Reparata on 8 October, San Lorenzo, San Zanobi and Sant’Anna as well as the feast of the patron saint San Giovanni and all the starting points of the Calcio Storico. To these must be added the Trophy of Marzocco on May 1, which is one of the most important flag-waving races nationwide. Stay connected to know what events and initiatives will be. Our official postage stamp ! Bandierai degli Uffizi are the Official Flagwavers of Florence, they belong to the hystorical "Corteo Storico della Repubblica Fiorentina" and to the famous "Calcio Storico Fiorentino", the traditonal ancient game of Florence. Is the only one flagwavers' Group that officially and institutionally represents the City of Florence. Their 45 years of history mean a long experience an a skill brought and appreciated all over the world.